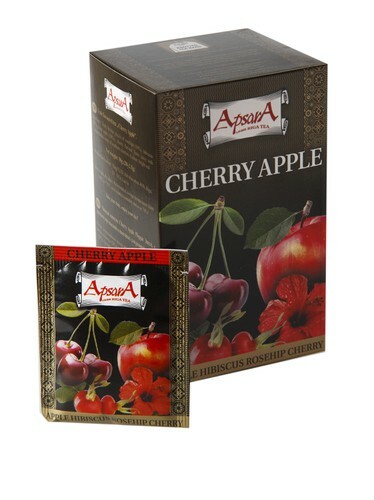 Fruit flavoured tea „ Cherry Apple”. Ingredients: finely broken pieces of rosehips, apples, hibiscus, cherry flavour. Taste: juicy with characteristic note of southern cherries. Brewing instructions: Boil fresh water. Use 1 teabag per 200ml of water. Recommended infusion time is 5-8 minutes. Product highligths: Fruit tea blend with a special character of warm, full ripe cherry.